No one knows what happened to the week-old foal’s mother. The little red-sorrel, dazed and operating on instinct, walked until a barbwire fence prevented him from stumbling into traffic on an intra-state highway. There, head hanging to his knobby knees, he leaned on a creosote covered power pole—an important defensive position where high desert predators are eager for an easy and unprotected meal. Foals are orphaned wherever wild or feral horses live in the rural American West. In this case, it happened along a road passing through an Indian reservation. Before long, travelers noticed. Phone calls flew. Weekends and vacations hindered native horse management communication. Frantically, concerned tourists sought solutions. No one knew who was in charge. The foal must have nursed from his former mother long enough to get a modest amount of colostrum—that extra rich milk every lactating mare possess’ briefly to pass along her immune system antibodies. However, the little red horse was far from safe. His digestive system hadn’t developed to where he could utilize grass as an energy source. As urgent phone calls continued, he weakened and infection spread. His future looked grim, without a source of digestible milk, the few days his mother bought him wouldn’t matter. Three days after the foal was spotted, a native woman could no longer tolerate the drama. She jumped in her car and found him, too weak to move, still leaning on his power pole. Encircling him with her arms, she loaded him into the back seat and drove him to her barn. The local horse rescue folks—those who specialize in orphan foals that are in a tough spot—got involved. Word spread and the red foal found himself moved to the barn of a nearby horse trainer. 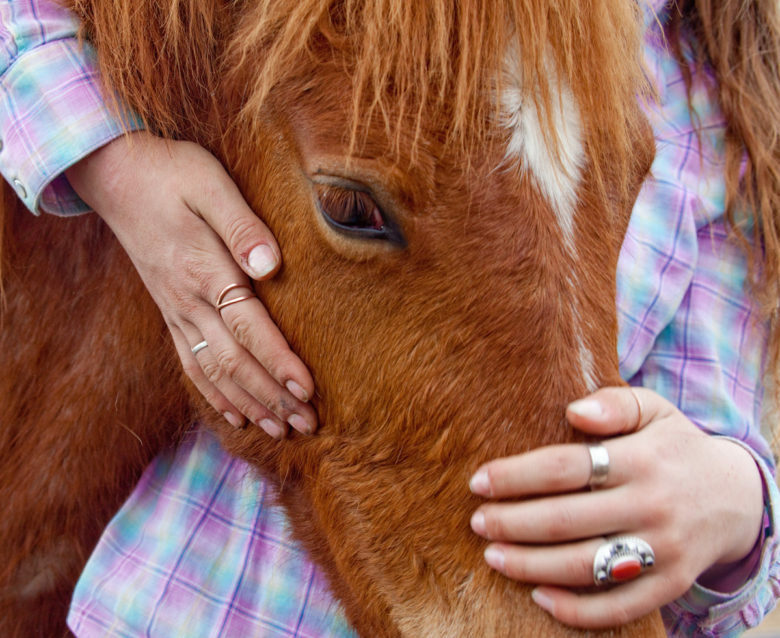 In ranch country, Cassie is called a “hand,” a person helpful to have around in variety of livestock situations—especially, the difficult ones. As the little horse was lifted out of the pickup bed, the name “Red” stuck, and Cassie knew she’d have her hands full. Red was in deep trouble. His nutrient and fluid retention were barely working, plus infection raged through his tiny body. Survival prospects for the youngster were slightly south of dismal. Cassie and her mother began round-the-clock care. Every two hours, one or both of the women arose to dribble slurry—made from goat’s-milk soaked alfalfa pellets and mixed with probiotics—into Red’s mouth. Afterwards, they’d adjust his large dog coat to keep him warm on chilly spring nights. Finished, they toppled back into bed and repeated the procedure every couple of hours. For two weeks, they were never sure if he’d be alive the next time they crawled out of the sheets. For two more weeks, the women continued their two-hour feeding schedule. Red began to gain weight and graduated into an extra-large dog coat. As summer began, Cassie looked forward to seeing Red’s face pressed against the gate at feeding time. He no longer needed socialization. Good manners were more important. His training began. Fall and winter passed. Red’s large, kind eyes, his extraordinary intelligence and bone structure impressed Cassie. Each day, he worked hard to please her. This seemed to be a horse looking for someone who worked hard in a rugged land. She thought about his future. An experienced livestock woman, Cassie knew of auctions where highly trained ranch geldings, in the right circumstances, could bring as much as a five-figure price. Living in a region described as ‘Poverty with a View,’ she got very quiet when she thought about her and Red’s options. Postscript: Red will be a year old this May. He’s still living with and learning from Cassie, the closest thing he’s ever had to a mother.